A sarcoma is a cancerous (malignant) bone tumor. A primary bone tumor originates in or near a bone. Most primary bone tumors are benign, and the cells that compose them do not spread (metastasize) to nearby tissue or to other parts of the body. A sarcoma is a type of malignant primary bone tumor. Malignant primary bone tumors account for less than 1 percent of all cancers diagnosed in the United States. They can infiltrate nearby tissues, enter the bloodstream, and metastasize to bones, tissues, and organs far from the original malignancy. Malignant primary bone tumors are characterized as either bone cancers which originate in the hard material of the bone or soft-tissue sarcomas which begin in blood vessels, nerves, or tissues containing muscles, fat, or fiber. Osteogenic sarcoma, or osteosarcoma, is the most common form of bone cancer , accounts for 6 percent of all instances of the disease, and for about 5 percent of all cancers that occur in children. Nine hundred new cases of osteosarcoma are diagnosed in the United States every year. The disease usually affects teenagers and is almost twice as common in boys as in girls. Osteosarcomas, which grow very rapidly, can develop in any bone but most often occur along the edge or on the end of one of the fast-growing long bones that support the arms and legs. About 80 percent of all osteosarcomas develop in the parts of the upper and lower leg nearest the knee (the distal femur or in the proximal tibia). The next likely location for an osteosarcoma is the bone of the upper arm closest to the shoulder (the proximal humerus). Ewing's sarcoma is the second most common form of childhood bone cancer. Accounting for fewer than 5 percent of bone tumors in children, Ewing's sarcoma usually begins in the soft tissue (the marrow) inside bones of the leg, hips, ribs, and arms. It rapidly infiltrates the lungs and may metastasize to bones in other parts of the body. More than 80 percent of patients who have Ewing's sarcoma are white, and the disease most frequently affects children between the ages five and nine and young adults between ages 20 and 30. About 27 percent of all cases of Ewing's sarcoma occur in children under the age of ten, and 64 percent occur in adolescents between the ages of ten and 20. Chondrosarcomas are cancerous bone tumors that most often appear in middle age. Usually originating in strong connective tissue (cartilage) in ribs or leg or hip bones, chondrosarcomas grow slowly. They rarely spread to the lungs. It takes years for a chondrosarcoma to metastasize to other parts of the body, and some of these tumors never spread. Parosteal osteogenic sarcomas, fibrosarcomas, and chordomas are rare. Parosteal osteosarcomas generally involve both the bone and the membrane that covers it. Fibrosarcomas originate in the ends of the bones in the arm or leg and then spread to soft tissue. Chordomas develop on the skull or spinal cord. Osteochondromas, which usually develop between the ages of ten and 20, are the most common noncancerous primary bone tumors. Giant cell tumors generally develop in a section of the thigh bone near the knee. Giant cell tumors are originally benign but sometimes become malignant. The cause of bone cancer is unknown, but the tendency to develop it may be inherited. Children who have bone tumors are often tall for their age, and the disease seems to be associated with growth spurts that occur during childhood and adolescence . Injuries can make the presence of tumors more apparent but do not cause them. A bone that has been broken or exposed to high doses of radiation used to treat other cancers is more likely than other bones to develop osteosarcoma. A history of noncancerous bone disease also increases bone-cancer risk. The amount of radiation in diagnostic x rays poses little or no danger of bone-cancer development, but children who have a family history of the most common childhood cancer of the eye ( retinoblastoma ) or who have inherited rare cancer syndromes have a greater-than-average risk of developing bone cancer. Exposure to chemicals found in some paints and dyes can slightly raise the risk. Both benign and malignant bone tumors can distort and weaken bone and cause pain , but benign tumors are generally painless and asymptomatic. It is sometimes possible to feel a lump or mass, but pain in the affected area is the most common early symptom of bone cancer. Pain is not constant in the initial stages of the disease, but it is aggravated by activity and may be worse at night. If the tumor is located on a leg bone, the patient may limp. Swelling and weakness of the limb may not be noticed until weeks after the pain begins. A needle biopsy involves using a fine, thin needle to remove small bits of tumor, or a thick needle to extract tissue samples from the innermost part (the core) of the growth. An excisional biopsy is the surgical removal of a small, accessible tumor. An incisional biopsy is performed on tumors too large or inaccessible to be completely removed. The surgeon performing an incisional biopsy cuts into the patient's skin and removes a portion of the exposed tumor. Performed under local or general anesthetic, biopsy reveals whether a tumor is benign or malignant and identifies the type of cancer cells the malignant tumor contains. Bone cancer is usually diagnosed about three months after symptoms first appear, and 20 percent of malignant tumors have metastasized to the lungs or other parts of the body by that time. Bone x rays usually provide a clear image of osteosarcomas. Computerized axial tomography (CAT scan), a specialized x ray that uses a rotating beam to obtain detailed information about an abnormality and its physical relationship to other parts of the body, can differentiate between osteosarcomas and other types of bone tumors, illustrate how tumor cells have infiltrated other tissues, and help surgeons decide which portion of a growth would be best to biopsy. Because more than four of every five malignant bone tumors metastasize to the lungs, a CAT scan of the chest is performed to see if these organs have been affected. Chest and abdominal CAT scans are used to determine whether Ewing's sarcoma has spread to the lungs, liver, or lymph nodes. Magnetic resonance imaging (MRI), a specialized scan that relies on radio waves and powerful magnets to reflect energy patterns created by tissue abnormalities and specific diseases, provides more detailed information than does a CAT scan about tumors and marrow cavities of the bone and can sometimes detect clusters of cancerous cells that have separated from the original tumor. This valuable information helps surgeons select the most appropriate approach for treatment. Radionuclide bone scans involve injecting a small amount of radioactive material into a vein. Primary tumors or cells that have metastasized absorb the radioactive material and show up as dark spots on the scan. Cytogenic and molecular genetic studies, which assess the structure and composition of chromosomes and genes, may also be used to diagnose osteosarcoma. These tests can sometimes indicate what form of treatment is most appropriate. A complete blood count (CBC) reveals abnormalities in the blood and may indicate whether bone marrow has been affected. A blood test that measures levels of the enzyme lactate dehydrogenase (LDH) can help predict the likelihood of a specific patient's survival. Immunohistochemistry involves adding special antibodies and chemicals or stains to tumor samples. This technique is effective in identifying cells that are found in Ewing's sarcoma but are not present in other malignant tumors. Reverse transcription polymerase chain reaction (RTPCR) relies on chemical analysis of the substance in the body that transmits genetic information (RNA) to evaluate the effectiveness of cancer therapies, identify mutations consistent with the presence of Ewing's sarcoma, and reveal cancer that recurs after treatment has been completed. Once bone cancer has been diagnosed, the tumor is staged. This process indicates how far the tumor has spread from its original location. The stage of a tumor suggests which form of treatment is most appropriate and predicts how the condition will probably respond to therapy. An osteosarcoma may be localized or metastatic. A localized osteosarcoma has not spread beyond the bone where it arose or beyond nearby muscles, tendons, and other tissues. A metastatic osteosarcoma has spread to the lungs, to bones not directly connected to the bone in which the tumor originated, or to other tissues or organs. In the 1960s, amputation was the only treatment for bone cancer. Between then and the early 2000s chemotherapy drugs and innovative surgical techniques improved survival with intact limbs. Because osteosarcoma is so rare, patients should consider undergoing treatment at a major cancer center staffed by specialists familiar with the disease. Amputation may be the only therapeutic option for large tumors involving nerves or blood vessels that have not responded to chemotherapy. MRI scans indicate how much of the diseased limb must be removed, and surgery is planned to create a cuff, formed of muscles and skin, around the amputated bone. Following surgery, an artificial (prosthetic) leg is fitted over the cuff. A patient who actively participates in the rehabilitation process may be walking independently as soon as three months after the amputation. Chemotherapy is usually administered in addition to surgery, to kill cancer cells that have separated from the original tumor and spread to other parts of the body. Although chemotherapy can increase the likelihood of later development of another form of cancer, the American Cancer Society maintains that the need for chemotherapeutic bone-cancer treatment is much greater than the potential risk. Surgery, coordinated with diagnostic biopsy, enhances the probability that limb-salvage surgery can be used to remove the cancer while preserving nearby blood vessels and bones. A metal rod or bone graft is used to replace the area of bone removed, and subsequent surgery may be needed to repair or replace rods that become loose or break. Patients who have undergone limb-salvage surgery need intensive rehabilitation. It may take as long as a year for a patient to regain full use of a leg following limb-salvage surgery, and patients who have this operation may eventually have to undergo amputation. Radiation therapy is used often to treat Ewing's sarcoma. Rotationoplasty, sometimes performed after a leg amputation, involves attaching the lower leg and foot to the thigh bone, so that the ankle replaces the knee. A prosthetic is later added to make the leg as long as it should be. Prosthetic devices are not used to lengthen limbs that remain functional after amputation to remove osteosarcomas located on the upper arm. When an osteosarcoma develops in the jawbone, the entire lower jaw is removed. Bones from other parts of the body are later grafted on remaining bone to create a new jaw. After a patient completes the final course of chemotherapy, CAT scans, bone scans, x rays, and other diagnostic tests may be repeated to determine if any traces of tumor remain. If none is found, treatment is discontinued, but patients are advised to see their oncologist and orthopedic surgeon every two or three months for the following year. X rays of the chest and affected bone are taken every four months. An annual echocardiogram is recommended to evaluate any adverse effect chemotherapy may have had on the heart, and CT scans are performed every six months. Patients who have received treatment for Ewing's sarcoma are examined often—at gradually lengthening intervals—after completing therapy. Accurate growth measurements are taken during each visit and blood is drawn to be tested for side effects of treatment. X rays, CT scans, bone scans, and other imaging studies are generally performed every three months during the first year. If no evidence of tumor growth or recurrence is indicated, these tests are performed less frequently in the following years. 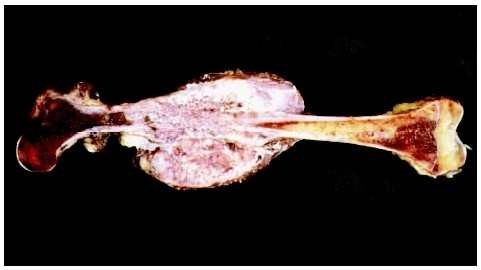 A specimen of a femur bone indicating the cancerous growth around the knee. Osteosarcoma is the most common primary cancer of the bone. Some benign bone tumors shrink or disappear without treatment. However, regular examinations are recommended to determine whether these tumors have changed in any way. Benign brain tumors rarely recur, but sarcomas can reappear after treatment was believed to have eliminated every cell. Likelihood of long-term survival depends on the type and location of the tumor, how much the tumor has metastasized, and on what organs, bones, or tissues have been affected. More than 85 percent of patients survive for more than five years after complete surgical removal of low-grade osteosarcomas (tumors that arise in mature tissue and contain a small number of cancerous cells). About 25 to 30 percent of patients diagnosed with high-grade osteosarcomas (tumors that develop in immature tissue and contain a large number of cancer cells) die of the disease. Two-thirds of all children diagnosed with Ewing's sarcoma live for more than five years after the disease is detected. The outlook is most favorable for children under the age of ten, and least favorable in patients whose cancer is not diagnosed until after it has metastasized: fewer than three of every ten of these patients remain alive five years later. More than 80 percent of patients whose Ewing's sarcoma is confined to a small area and surgically removed live, for at least five years. Postsurgical radiation and chemotherapy add years to their lives. More than 70 percent of patients live five years or more with a small Ewing's sarcoma that cannot be removed, but only three out of five patients with large, unremovable tumors survive that long. There is no known way to prevent bone cancer. Careful attention to a child's diet can be very helpful for patients with cancer. This can be difficult when the cancer and/or the treatments are affecting the appetite, however. Whole foods, including grains, beans, fresh fruits and vegetables, and high quality fats, should be emphasized in the diet, while processed foods should be avoided. Increased consumption of fish, especially coldwater fish such as salmon, mackerel, halibut, and tuna, provides a good source of omega-3 fatty acids. Nutritional supplements can build strength and help maintain it during and following chemotherapy, radiation, or surgery. Guided imagery and relaxation techniques can be helpful for children undergoing difficult treatments. Support groups for the child and the family can be very helpful and can give provide an important emotional outlet for the child, the parents, and the siblings. Brennan, Murray F., et al. Diagnosis and Management of Sarcoma. Oxford, UK: Isis Medical Media Limited, 2002. Ewing's Sarcoma: A Medical Dictionary, Bibliography, and Annotated Research Guide to Internet References. San Diego, CA: Icon Group International, 2004. CancerCare Inc. 1180 Avenue of the Americas, New York, NY 10036. Web site: http://www.cancercare.org. National Cancer Institute. Building 31, Room 10A31, 31 Center Drive, MSC 2580, Bethesda, MD 20892–2580. Web site: http://www.nci.nih.gov. "Ewing's Sarcoma." Children's Cancer Web , January 11, 2003. Available online at http://www.cancerindex.org/ccw/guide2e.htm (accessed December 30, 2004).